With the right knowledge and temperature control equipment, you can keep food safe and delicious. Even extreme environments and long hold times can’t thwart a dedicated and well-equipped caterer/restaurateur. Regularly remind your staff about Time/Temperature Control techniques and the necessary equipment for food safety and quality. The aim is to minimize the period TCS foods remain in this zone. If food spends four or more hours in this range, it really should be discarded. 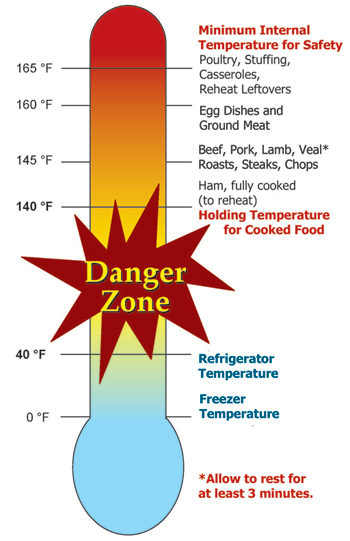 Also known as Potentially Hazardous Foods (PHFs), Time/Temperature Control for Safety (TCS) foods must be kept out of the Temperature Danger Zone (see below). At these temperatures and with adequate moisture, bacteria can double their populations every twenty minutes! Most TCS foods go bad after only 4 hours in the Temperature Danger Zone. Because acids kill many strains of bacteria, pH levels also affect food safety. (0 pH is most acidic, 7 is neutral, and 14 is most alkaline). TCS foods typically have pH levels of 4.6 to 7.5. According to the University of Minnesota, foods should be held at temperatures above 140 °F to prevent rapid bacteria growth. Cold storage (cold holding) of food must take place below 40 °F. Even your newest employees probably have the common sense to keep meat and dairy products out of the heat. However, not everyone understands the wide range of temperatures at which food can go bad. Keep your staff aware of food safety with the following quick questions about temperature control. 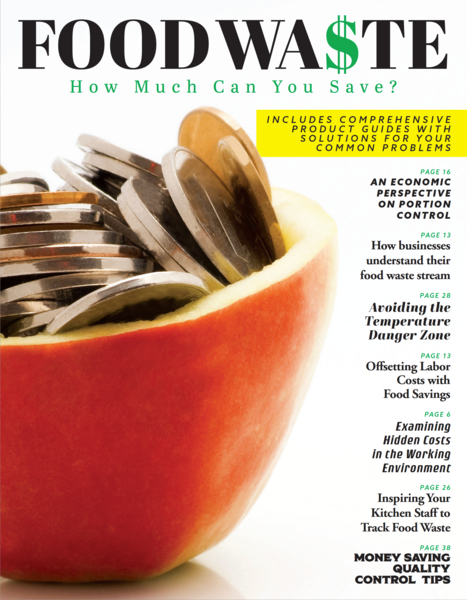 At the end of the day, you need to minimize your food waste and maximize your profits. By teaching your employees to keep food at appropriate temperatures and cool hot foods quickly, you can keep your customers’ trust. What’s more, you’ll ensure every dish reaches the table at a perfect temperature, and with excellent quality! Of course, if food stays out of the Temperature Danger Zone, you don’t have to dispose of it. By keeping dishes and food products at safe temperatures for longer periods of time, you can reuse more of them and dramatically decrease your food waste expenses. 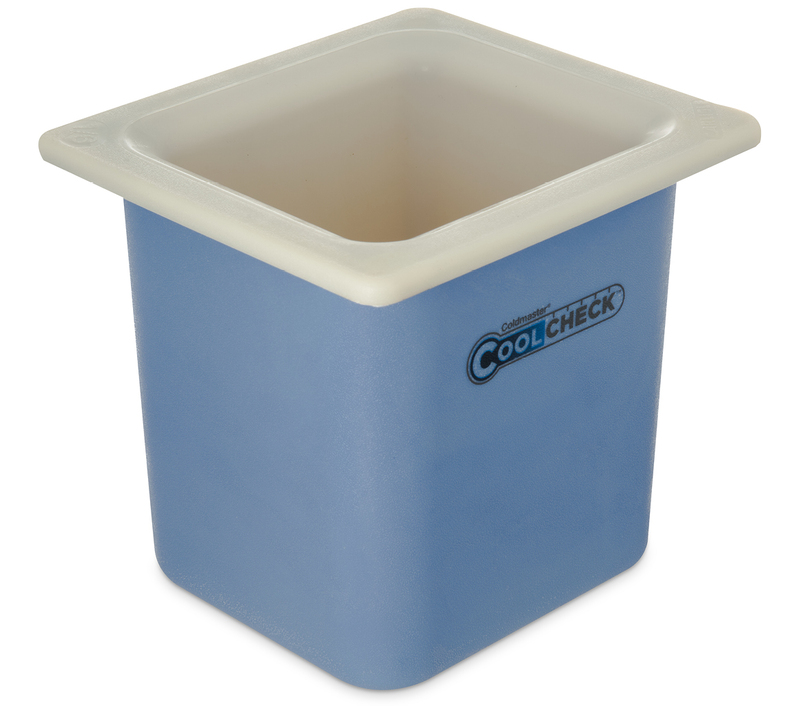 For the coolest in cool, get Coldmaster CoolCheck insulated cold pans. These beauties turn blue when safely cold; when they get warm, they fade to white. For small quantities of foods (salad bars, buffets, etc. ), get Coldmaster Pan Organizers that hold nine one-ninth-size food pans. With this technology, your staff will know exactly when to move food into fresh pans to keep it cool, safe, and delicious. Experienced caterers bemoan the massive amount of ice people waste at salad bars and outdoor catering venues. 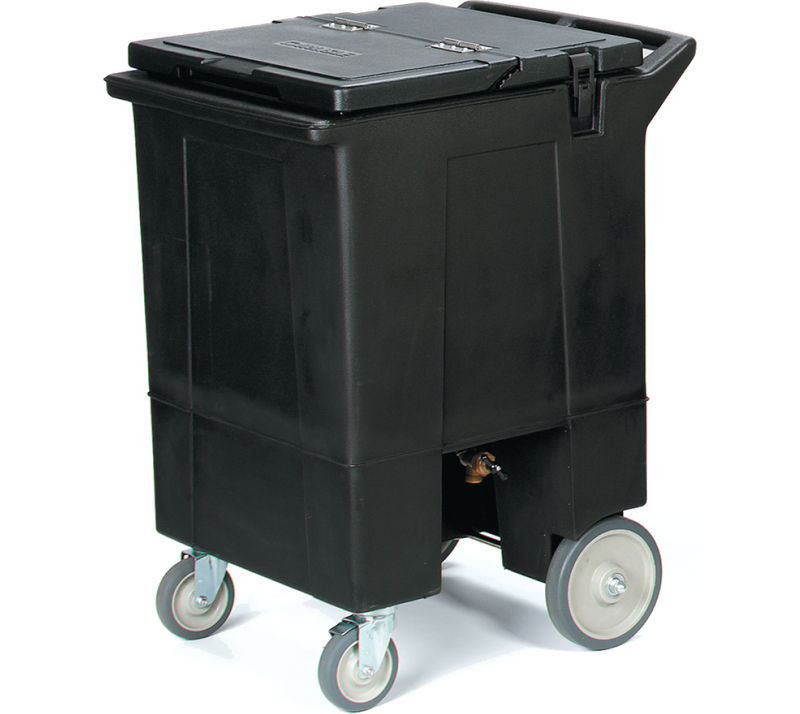 Cateraide Ice Caddies feature extra-thick foam insulation to keep your ice costs low, even at the most sweltering midsummer events. Coldmaster Food Pans and Lids make ice baths completely unnecessary. These standard-size food table pans feature sealed and insulated gel packs for up to eight hours of below 40°F operation. You can even get Designer Coldmaster table top dishes that keep food safe and cold for up to four hours! Many cafes and caterers leave milk/egg cartons (and whipped cream canisters) out for long periods of time. Keep these TCS foods safe and at optimal quality with long-lasting (up to 9 hours) Coldmaster Chillers. The Coldmaster Ice Cream Server is perfect for outside ice cream parties. 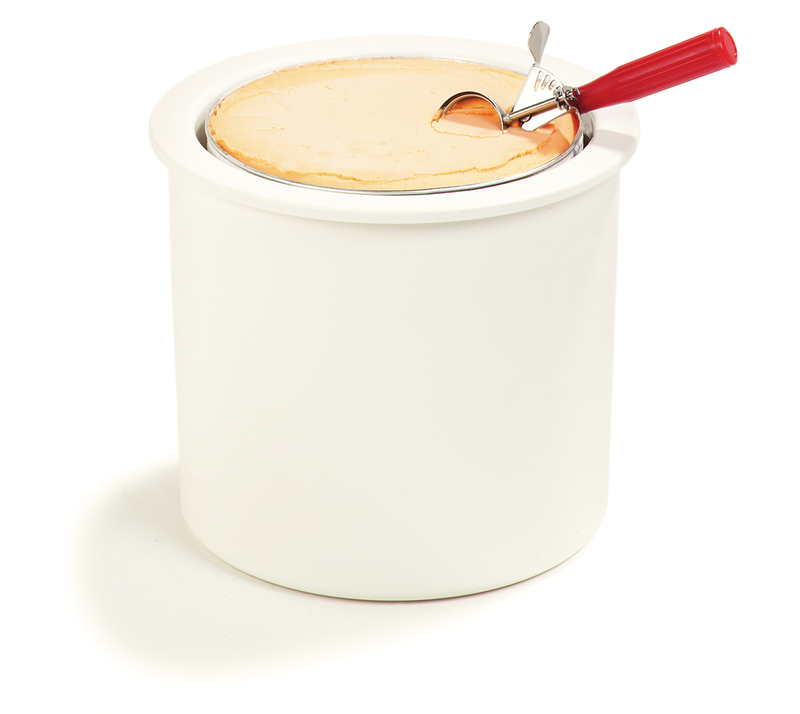 It ensures that 3-gallon ice cream tubs stay frozen for hours. 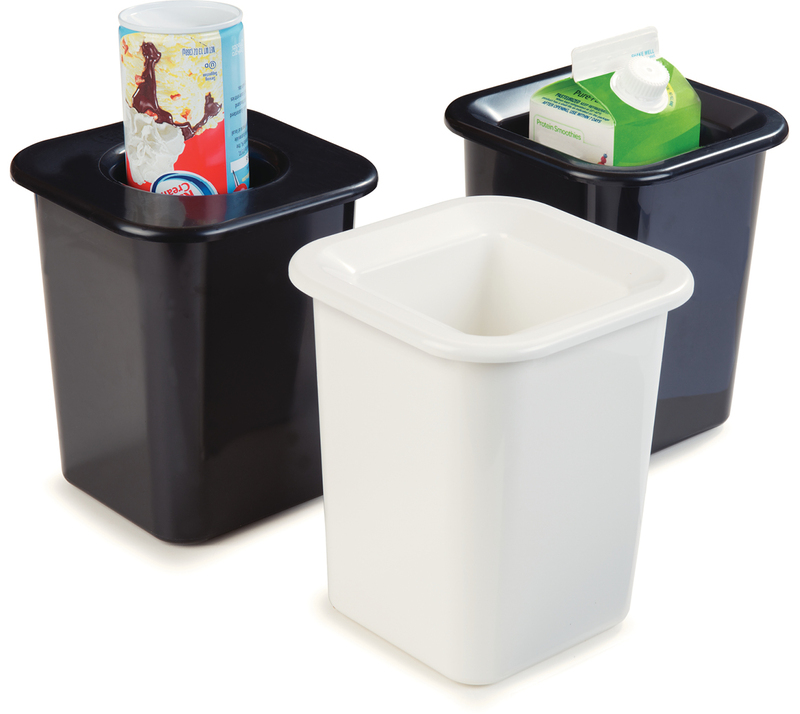 When moving your ingredients and food products across town (or across the nation), you need sturdy and stackable containers that prevent spills and handle extremes of heat and cold. 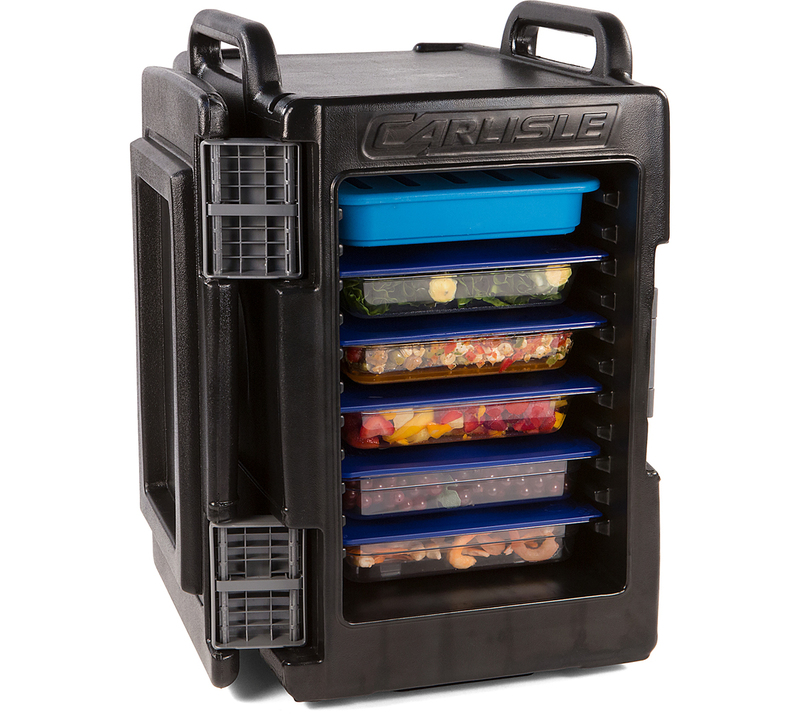 Choose Carlisle Cateraide food transportation products for safe transport, especially when moving food products over long distances. Q: What is the temperature danger zone? A: Keep foods out of the 40°F to 140°F range, in which bacteria grow most quickly. Q: How quickly must you cool down hot foods? A: The University of Minnesota (and the CDC) recommend the two-step food cooling process. In two hours or less, cool food from 140°F to 70°F (bacteria grow the fastest in this range). Over the next four hours or less, cool it from 70°F to 40°F. Q: What’s the minimum cooking temperature for chicken? A: 165°F. Extra points for mentioning the time aspect of temperature control (15 seconds in this case). Ask your cooks and food-handlers to view the FDA’s recommended temperatures/times for many types of TCS foods. Q: What are the best ways to quickly cool down hot foods? A: Cut large pieces of food into small chunks. Use ice baths or ice paddles.